Second-round pick Ryan Donato meets some of the Bruins’ management team, including team president Cam Neely (left), after being selected. PHILADELPHIA — As an 18-year-old rookie, Patrice Bergeron spent some time at a teammate’s Scituate home. Bergeron probably didn’t think that the 7-year-old boy running around the house might be his future teammate. On Saturday, the Bruins made the little kid their property. 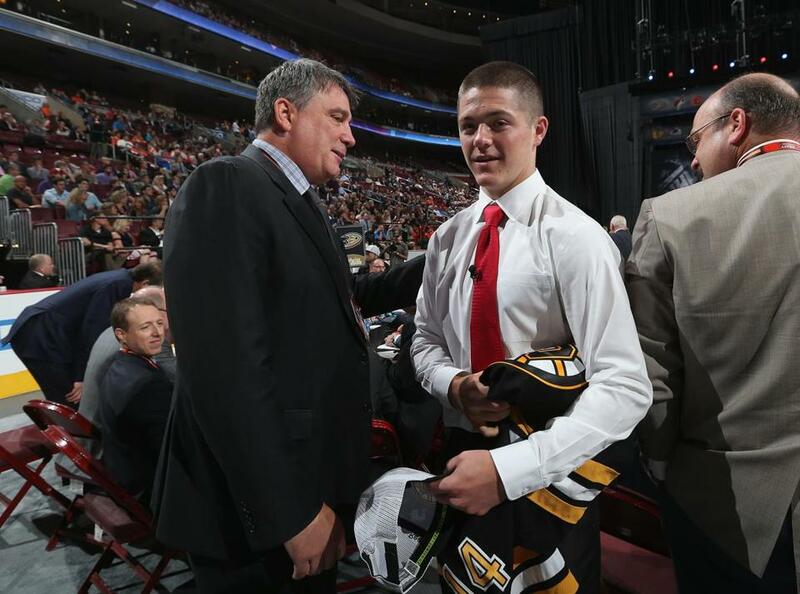 Ryan Donato, son of ex-Bruin and current Harvard coach Ted Donato, went to Boston in the second round of the NHL Draft. The 18-year-old Donato scored 37 goals and 41 assists in 30 games in 2013-14 at the Dexter School in Brookline for uncle Dan Donato. Donato described himself as a forward who likes to go to the net to create scoring chances. He said his speed was the area that requires the most improvement. The Bruins were also concerned about his conditioning. But according to director of amateur scouting Keith Gretzky, the Bruins were impressed with Donato’s commitment to improving his fitness prior to the NHL combine in May. The Bruins picked Ryan Donato in the second round before taking two more forwards and a defenseman with their final three picks. The right-shot forward has committed to playing for his father at Harvard for 2015-16. He has yet to be accepted by the university. Donato will have a decision for 2014-15. He could return to Dexter for his senior year. He could also play for Omaha (USHL), which owns his rights. The Bruins will have some input on Donato’s decision. They would prefer Donato go up against better players in the USHL. This is the second straight year the Bruins have picked an alumnus’s son. Last year, they drafted Ryan Fitzgerald, son of ex-Bruin Tom Fitzgerald. The Bruins picked two freshmen-to-be in the fourth and fifth rounds. With the No. 116 pick, they drafted forward Danton Heinen, who will attend the University of Denver this fall. One round later, the Bruins picked Anders Bjork. The forward will be a freshman at Notre Dame in 2014-15. Heinen scored 29 goals and 33 assists for Surrey of the BCHL last year. He considered Michigan Tech and Nebraska-Omaha before committing to Denver. Heinen, who described himself as a late bloomer, didn’t get interest from any major junior teams. As a Pioneer, Heinen will play for Jim Montgomery, former coach of Dubuque of the USHL. Chiarelli is a part owner of the Dubuque team. Chiarelli played a role in hiring Montgomery, the former University of Maine standout, for Dubuque. Bjork scored nine goals and 12 assists in 26 games for the National Team Development Program’s Under-18 team last year. Gretzky described Bjork as an up-and-down winger. The Bruins are not rushing to replace Geoff Ward. The assistant coach resigned earlier this month to become head coach of Mannheim in Germany. Ward had at least two years remaining on his contract with the Bruins. Chiarelli and coach Claude Julien are reviewing candidates. It’s possible the new assistant could be responsible for the power play, which was one of Ward’s tasks. Julien attended the draft on Friday. He spent time with David Pastrnak, the Bruins’ first-round pick, after the selection. Julien didn’t stay for Rounds 2-7 . . . The Bruins picked Emil Johansson in the seventh round. The Swedish defenseman played for HV71’s junior team, scoring two goals and seven assists in 42 games . . . The Canucks, led by former Bruins assistant GM Jim Benning, drafted Boston College goalie Thatcher Demko in the second round. In 2004, Vancouver drafted former BC puck-stopper Cory Schneider in the first round . . . Demko was the second goalie taken. Calgary drafted Mason McDonald 34th overall, two slots before Demko . . . The Bruins had four picks on the draft’s second day. They surrendered their third-round pick to Philadelphia in the Andrej Meszaros trade. They swapped their sixth-rounder to St. Louis for Wade Redden.